Published in the Albert Lea Tribune week of October 5, 2015. Older houses have character. Usually I love older houses, but the older I become the less enthralled I am with an older home. 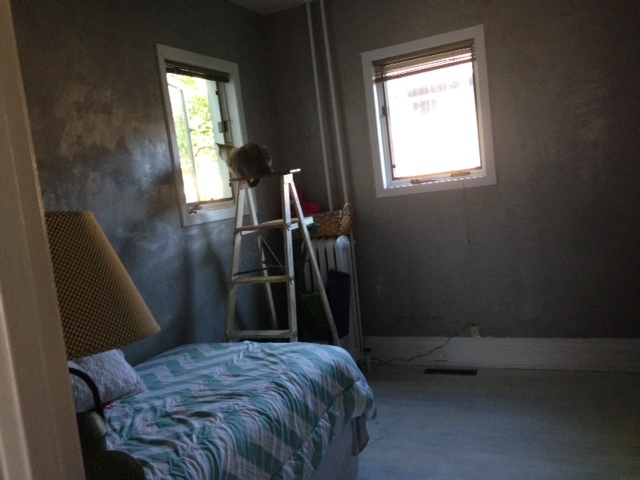 I love redecorating and all that it entails, including painting, scraping, ripping wallpaper, etc. Or at least I did until I became creaky like older homes. Recently I stripped the 60-year-old wallpaper off the wall. The old plaster walls had seen their day. In my dream world I would have knocked the plaster down and taken the walls back to the studs and put some sheetrock in. However, the job would have been more than I could afford, and I didn’t think my husband and I were up to the task as we might have been when we were younger. I decided since I like character in houses I would put Venetian Plaster on the walls and repaint the hard wood floors for the time being. The old floor was in terrible shape and needed to be replaced with new hardwood. Again cost was an issue. I went the shabby sheik route with paint and varnish. It looks good and makes me feel as if I am in a cottage which was the atmosphere I was going for. I watch “House Hunters” on HGTV religiously, and the offshoot shows such as the “Beach House Hunters” and the “House Hunters International.” The premise, in case you haven’t watched, is a house hunter views three properties and decides on one that fits his or her lifestyle. I also like the flip shows where a couple finds a house and someone remodels the house to their specifications. I have “Really?” moments when watching the couples walk through houses, especially young couples. Comments such as the granite countertops would have to change because the couple doesn’t like the color, or the bathroom needs to be updated when it is a perfectly beautiful and fine bathroom. Everyone must have a master suite, and there must be at least three bathrooms and a bedroom for each child that lives in the house, plus room for guests. Kitchen cupboards make the list, too, as always needing to be updated. I roll my eyes during many of the shows because what is criticized or replaced looks very nice, and many of us would be very happy to have what is already there in the houses. The shows, although I love them, show us how spoiled we are as Americans because of what we expect to have as housing and furnishings. It is easy to get caught up in the expectations of society and began to want and demand perfection in our lives. If one of these TV gurus on HGTV looked at my house, they probably would tear the entire building down. My house is not perfect. My plaster walls tell a tale of use and love and former occupants. The paint is peeling on the trim and there are a few dings in the siding. The wear isn’t there because we don’t care about keeping up our home, it is there because it is well-lived in, and although we have maintained the home over the 20 some years we have owned it, an old house always is asking for love for its owies. Communities are stricter in what they allow and don’t allow. I once heard someone in authority in my community make a comment about a house in a different neighborhood. According to them the house was an eyesore and I must admit it was, because of lack of paint and lack of maintenance. This person thought it needed to come down even though someone was living in it. I happened to know the person living in the home couldn’t afford the repairs or the paint. They couldn’t do it themselves because of medical reasons. And yet someone thought their house needed to come down because it looked bad in the community. It wasn’t beyond salvaging and it was someone’s home, who would lose a home and have a hard time finding another one. I used to make the same judgement until I got older and circumstances changed and my house needed some tender loving care. We do what we can with what we have. Last year was new windows, this year was new garage doors and next year will be new siding for the garage. Little by little my crooked little old house will have an owie fixed, but then, as time marches on, the owies will continue and we will continue to do what we can to find a fix within our means. Our bodies are aging and some things we can’t do ourselves anymore. It is always an option if you can’t do the work for a home to sell it. The reality is that if your home needs work it will lower the price and it has to pass inspections. The reality is for many people in those houses you see that need painting and fixing and a lawn that needs grooming, is that it would be too expensive for them to live anywhere else. It is a catch 22. When you see a home needing repair help consider maybe the homeowner needs help too. We don’t walk in their shoes, we don’t live behind their doors and we don’t know the pride they have so they don’t admit their dilemma and ask for help. Tags: Albert Lea Tribune, Author, Author Julie Seedorf, Coffee, Fuchsia, Granny Hooks A Crook, Granny Skewers A Scoundrel, HGTV, Old house, paint floors, Remodel, Something About Nothing, The Courier Sentinel, veneian plaster, Whatchamacallit? Thingamajig?